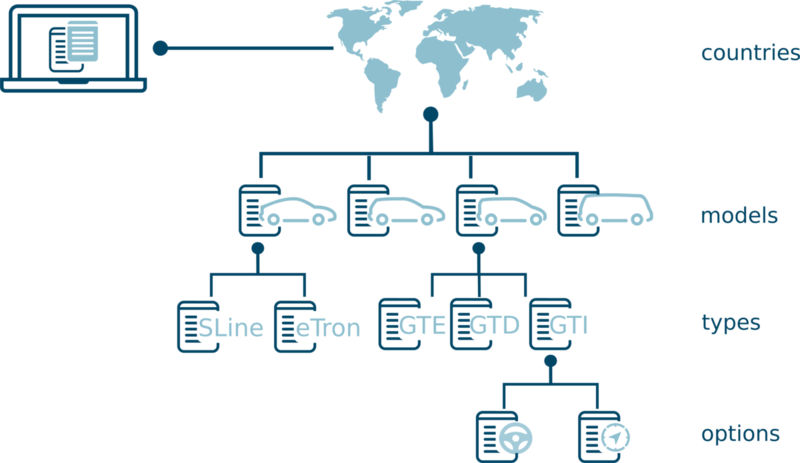 The API offers the Volkswagen product data catalog, and resources to configure a car in an iterative manner. Options: e.g. App-Connect and "Volkswagen Media Control"
In order to maintain an adequate service level of OKAPI, the API endpoints incorporate a throttling mechanism that will limit the requests by an application to a reasonable amount per day. Within the next days you receive an email with your client credentials in detail your client_id and your client_secret. To obtain access to the OKAPI HTTP service we use the OAuth2 client credentials grant to provide an access_token. The access_token provides access to the OKAPI services. It expires after one hour. Please ensure that your backend application handles the lifecycle of the access token. The token endpoints offer the ability to request a refresh token that should be used to request a new access token. More information about access_tokens can be found in the official OAuth spec: https://tools.ietf.org/html/rfc6749#section-1.4. To request the access_token you have to provide the client_id and your client_secret. You will need the access_token for every subsequent request to okapi. It will expire after one hour. You can additionally request a refresh token in order to get a new access token. The API offers a selection of catalag and configuration endpoints. The catalog endpoints provide static data containing the productdata. 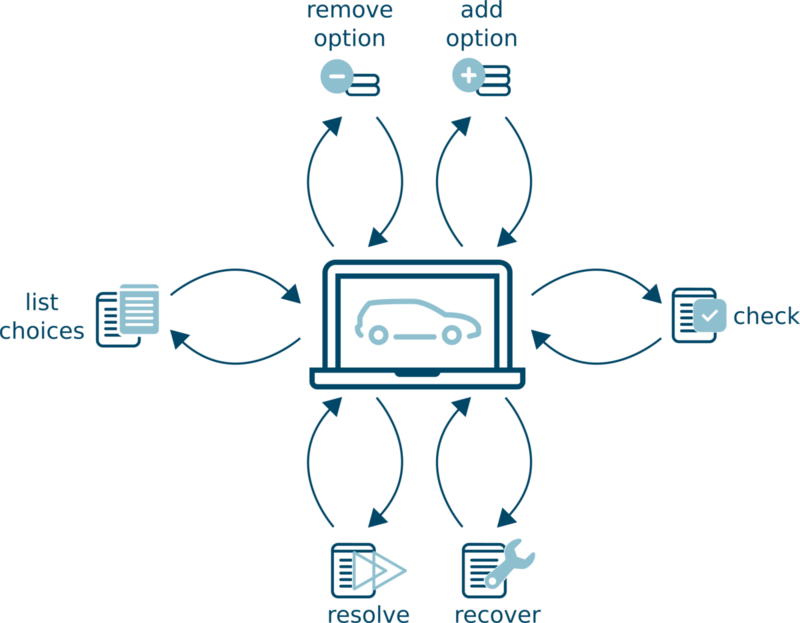 The configuration endpoints provide the ability to iteratively store and configure a car. The product data catalog provides static data about supported countries, available models, types and options. All catalog endpoints are responding with an etag header that shows you current version of the provided product data. Whenever we are updating parts of the provided product data, the etag value will change. ETag The identifier for a specific version of a catalog resource. If you provide the etag value as request header (if-none-match) and the data has not changed, all catalog resources will respond with the http status code 304 not modified. If-None-Match Your stored ETag hash of a former request. "name": "GTI 1.0 TSI Ottopartikelfilter 85 kW 6-Gang"
"name": "up! beats 1.0 TSI 66 kW / 90 PS 5-Gang Manual"
"description": "VE: \"WOODSTOCK\", black 15-inch alloy wheel for JOIN"
"description": "color pack \"hot orange\" incl. alloy wheels \"la boca\" 6J x 16"
To configure a car iteratively you have to create a configuration which you can utilise afterwards to gather valid options, add or remove them, or retrieve other information about this particular configuration. Every configuration will be cached for you for 24h after your last modification. These intent resources provide some basic functionality to interact with consumer provided configurations. Check the buildability for a given configuration. The response contains the information whether the given configuration is buildable and distinct. So what do we mean if we talk about a distinct configuration: If you provide a partial configuration, and the combination of options is buildable, there might be several options, on how a car could be build. A distinct configuration defines enough options to make out just one vehicle. We will always try to autocomplete a partial configuration, but in order to identify a single buildable vehicle we need as many options as it takes that there could be just one version of a vehicle left: In the example the selection of the red hubcap just leaves one option to build that vehicle. If you want to speed up the buildability check, you can provide the request parameter ?distinct=false, to skip the distinct check. Request the WLTP values for a configuration. In order to request the WLTP values the given configuration has to be distinct. You can always call the check resource in order to assure that the configuration is distinct, before issuing a call to request the wLTP values..
To complete a partial configuration to a fully equipped and buildable car, you can use the resolve function of the options endpoint. We will amplify the given set of options with a selection of options that will make your current partial configuration a distinct one. The request responds with a completed and distinct configuration. The options added to the configuration's set of options will provide just one random example of how a partial configuration might be extended to gather a distinct configuration. If your configuration has already been distinct the response will just contain the given configuration. To recover a given configuration that is not buildable, okapi will search for options that are conflicting with your current selection of options but valid options within the model. The request responds with a recovered configuration. If the configuration contains options, that are not valid within the given model, the resource will respond with a 409. At every point within the configuration process you can request the list of choices. A choice contains options that are either valid or invalid within the current configuration. Beside this information a choice defines a category/domain of a given configuration that can be customised with options that are provided. We are using the uuid Version 5 which is a standard uuid calculated by a namespace and a name, in order to provide the ability to calculate uuids in a deterministic way, utilising the id/qualifiers of the former data tree. UUID V5 offers different modes to calculate a uuid we are using the namespaceMode URL in order to calculate a root hash from the project's URL (https://productdata.vwgroup.com). This uuid will be the parentUUID for the first level tree branches of the data, which are the brands. Every brand's uuid will use the namespaceMode UUID, therefore using the root uuid as parentUUID and the legacyBrandId (e.g. 'V' for Volkswagen) as name in order to calculate the brand's uuid. This way we are also calculating the model's uuid (using the brand's uuid as parentUUID and the legacy modelId as name), and the typeId (using the model's uuid as parentUUID and the legacy typeId as name). We are using content negotiation. Do you? All resources will contain a specific representation. Content negotiation determines whether the resource can be requested or provided in a specific representation. Therefore we will check every request whether the Accept header is set, and we can provide the desired representation. If the resource cannot provided in the requested representation the API will respond with a http status code 406 (Not Acceptable). If you omit the header we will fallback to the value application_json and therefore respond in json. Additionally all resource will respond with the provided representation within the header Content-Type. If you want to get more information on content negotiation please visit the rfc specification. We will update the data provided constantly. If you are storing references of our data on your side you can utilise the http ETag header to check whether the data has changed since your last request. All Catalog endpoints will respond with an ETag header which keeps a hash value of the data the resource contains. As soon as the data changes this hash will change. You can store the hash on your side and provide it as value of the If-None-Match header in every request. If you provide this header and the content has not changed, the resource will respond with a 304 (Not Modified) and no body. If the content has changed, it will respond with a 200 providing the requested response body, and the new ETag value within the header. If you want to get more information about entity tags please visit the rfc specification (3.11 Entity Tags). If you are not able to receive any WLTP Data there are a few things to consider. You have to provide a buildable configuration. To assure that your configuration is buildable please take a look at how to check whether your configuration is buildable. You have to provide a distinct configuration, though we are just able to calculate the values if the selection of options within the given configuration point out just one single vehicle. To assure that your configuration is distinct please take a look at how we define a distinct configuration. Additionally there is the option that no WLTP Data is available for the requested configuration, which will be indicated by 204 (Not Found) response. A distinct configuration defines enough options to make out just one vehicle. We will always try to autocomplete a partial configuration, but in order to identify a single buildable vehicle we need as many options as it takes that there is just one version of a vehicle left: The first example picture shows a buildable partial configuration on the left side, which could make out three different ways to complete a vehicle that could be ordered. The selection of the red hubcap in the second picture identifies the red vehicle definitely. Therefore the selection of the given option makes out a distinct configuration.